The apartment is on the 5th (top floor) of a recently renovated residence in the spa town Brides Les Bains. Only 300m from the town centre and 600m from the Gondola, which gives direct access to Meribel and the whole of the three Valleys - the largest ski area in the world. The apartment is a generous 56m2 which includes a large living and dining area, kitchen, one double bedroom (King size bed) with ensuite shower room, a second bedroom with bunkbeds, one bathroom with bath and shower and a separate toilet. There is also a cabin area with bunk beds in the hallway, this is a cosy area separated from the main living room by a curtain for privacy to create a 3rd bedroom. There is a large balcony with seating for 6 and lovely views of the mountains. The apartment sleeps 6 adults comfortably but we can accomodate a maximum of 7 ( by using the sofa bed or travel cot) if some guests are children. The apartment is well equipped for a self catering holiday with many extras that you may not always find in a rented apartment including our own unlimited free wifi for our guests. We also have a private parking space in the underground garage. The kitchen is well equipped with microwave, a separate large (52 litre) oven, 4 ceramic hobs, toaster, kettle, coffee maker, dishwasher, fridgefreezer and plenty of kitchenware to self cater for 6-7 people. There is also a washing machine ( very useful for guests with children or guests staying for several weeks). In the lounge you will find a large wall mounted TV with DVD player. The TV is 'SMART' allowing guests to make use of netflix, utube etc. French TV channels are also available. There is also smaller TV and DVD player in the bedroom. A selection of Dvds and boardgames are also available. There is a shared indoor swimming pool with an adjacent hot tube that is free for guests to use. The Intersport ski rental shop situated in the residence makes hiring ski equipment very convenient and our guests benefit from discounted prices. Fresh bread and croissants and are sold in reception every morning throughout the winter season. The closest restuarant is just 100m away. Our apartment has its own washing machine but there is also a shared 'pay as you go' laundry room in the residence which has tumble driers if needed. We have a local English couple (French speakers) who manage and clean the apartment and they are there to help you should any emergencies arise - contact details will be supplied when you book. They can supply extra cleaning, linen and many other services if requested. They can also arrange a food and or wine pack to be in the apartment on arrival on request. We have negotiated various discounts for our guests: the Inter-sport ski hire shop situated in the residence will give you a 40% discount off equipment hire and there is 5% off lessons with 'Magic in Motion' & New Generation ski schools in Meribel. We can also arrange for discounted ski passes to be purchased before you arrive - these will be waiting in the apartment for you when you arrive. All details when you book. Keys will be in a key safe outside the apartment, including a fob to open the underground garage. You will be given a security number for the key safe when you book and pay your deposit. You can therefore arrive as late as you like with no fear of not getting in! The Three Valleys, in the heart of the French Alps has rightly earned its name as the largest integrated skiing area in the world. 330 marked ski-slopes offer a total of 600 kilometres of pure skiing enjoyment. Thanks to around 180 ski-lifts, the ski-slopes (between 1300m and 3200 m) are reached quickly and easily, including glacier areas. The enormous infrastructure of ski-runs and lifts connects not only the large ski stations at Val Thorens, Les Menuires, Meribel-Mottaret and Courchevel with one another but also the up-and-coming smaller skiing locations at Saint Martin and La Tania. The Belleville valley, with the ski stations St. Martin, Les Menuires and Val Thorens, the Courchevel valley with its tiered landscape districts of Courchevel 1300, 1550, 1650 and 1850 are all connected together with the centrally situated Méribel valley into a massive skiing area. Good Skiers can experience all three valleys of the skiing area in a single day, having the choice of countless ski-runs. However there is something for everyone from easy to difficult runs, so that experienced skiers as well as beginners can enjoy the three Valleys. The Olympic Centre in Meribel has an ice rink, Olympic size pool with kids pool and slides, and crèche facilities. All just at the top of the Gondola from Brides Les Bain. Meribel itself also offers an impressive choice of Apres-Ski, cafes, restaurants and shops. There are free shuttle buses up to Meribel one evening a week (look on ski.Brides-les-Bain website for up the up-to-date time table). Brides Les Bains is also famous for its spa and thermal bathing facilities. In the summer it is as lively as in the winter and is a great base to explore the Alps (walking, mountain biking, horseriding, white water rafting, kayaking etc). It is a very pretty town with a central central river, lots of lovely shops, bars and restaurants, but without the high prices of the rest of the three valleys. We live in Hertfordshire with our 3 children. Owning a family holiday home in the Alps has been a dream that we fulfilled in 2007. We love to ski as a family but since owning our apartment have also discovered how much the Alps has to offer in the Summer. If you choose to stay in our apartment we hope you enjoy it as much as we do. After many family holidays in the 3 Vallees we discovered the pretty spa town of Brides les Bains and loved the ease with which we could get to the slopes of the 3 Vallees by either Gondola or car. With a growing family we wanted an apartment that was big enough for an enjoyable family holiday rather than some of the more ‘petite sized’ accommodation we have encountered in the past. We were fortunate enough to buy one of the best apartments in the residence – 2 bedrooms, top floor, with a beautiful mountain view. Unlike many ski resorts, Brides continues to be a popular holiday destination throughout the year and is a great place to explore the Alps in the spring and summer. Brides les Bains is an excellent value base from which to explore the 3 Vallees. It is far more reasonably priced than the rest of the area for pretty much everything – whether it is ski hire, a baguette or a cup of coffee ! If you have stayed in Residence Cybele before, you will find that our apartment is better equipped and benefits from many personal touches that other apartments don't have. We are also one of the few apartments to have installed our own WIFI connection and own washing machine. We usually drive to Brides as it is only 8 hours from Calais so the journey can be completed in one day. if you don't enjoy driving, you can get the Eurostar from London St.Pancras to Moutiers whch is only a 15 minute taxi trip away from Brides. The main bathroom has a bath with shower over, vanity unit with two washbasins and cupboard. Large heated towel rail. Next to the bathroom there is a separate toilet. En-suite shower to Bedroom 1 with shower, sink and heated towel rail. Bed linen can be provided on request for an additional cost per person. Our apartment has its own washing machine and there is an airer for hanging up clothes. Also, tumble dryers are available in the shared laundry room in the residence for a small fee. Tumble dryers are available in the shared laundry room is the residence - there is a small fee. One private space in covered garage. There are some free outside spaces on a first come , first parked basis. The apartment has a private car parking space in the underground garage. Free WIFI is avaiable in the apartment for guests. Great should you wish to facetime or skype family and friends. Towels can be provided on request for an additional cost per person. Spacious living area with sofa and large flatscreen TV, DVD player and WIFI. Dining table with 8 chairs, coffee table and wall heater. The sofa converts to two single beds. A large table top oven has recently been added to the kitchen. Most apartments in the residence do not have a separate oven. The kitchen is well equipped with oven, separate microwave, 4 ceramic hobs, fridge-freezer, toaster, kettle, dishwasher and all the kitchenware than you will need to self cater for 6-7 people. Wall mounted flat screen 'SMART' TV in lounge. There is also a TV in bedroom 1. There is a dvd player in the lounger and a another DVD player in bedroom 1. There is a coin operated pool table in the reception area. The balcony has a table and 6 chairs. There are lovely mountian views. There is a small communal indoor pool and hottub which residents can use. Normally open Sunday - Friday until 6pm ( closed on Saturday). Any closure of the pool for maintenance is beyond our control. Additional Pricing Information : End of Stay Clean £60 Taxe de Sejour ( tourist tax) will be automatically calculated and added to your booking. Linen and Towels can be provided for £20 per person although guests are also welcome to bring their own. Great place, really spacious, great value! You can't go wrong with this apartment...loads of beds and loads of space. A nice sized kitchen and balcony as well as space to relax and watch TV. Brides is a beautiful place both in Summer and Winter and you couldn't choose a better place to base yourself for your trip! Thank you for your review. Yes, Brides is lovely in both winter and summer. We are pleased to hear you enjoyed your stay. Perfect location, accommodation spot on for our needs (6 adults), comfy beds, two showers, ample 'living' space, well appointed cooking facilities wise, wifi excellent and easy. Plenty of bars/restaurants in the village, local Intersport helpful, drove up each day so did not use the bubble lift. Would (will) stay again. Great to hear that you enjoyed your ski holiday and found our apartment both spacious and comfortable. We do hope you stay again in the future. Thank you for your review. A really great apartment which worked well for the family. Thank you for your review. The apartment does work well for families and we are pleased you had a great stay. 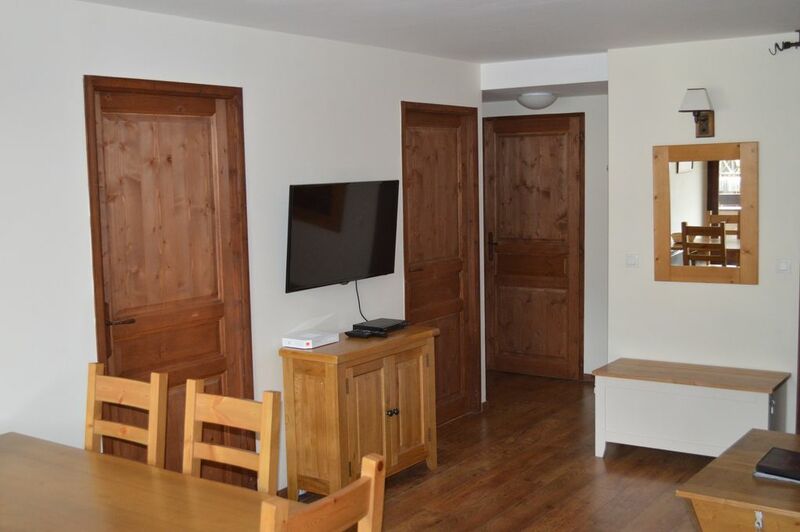 Superb apartment in a great location with easy access to Meribel! Excellent apartment with good facilities in Brides Les Bains. Friendly, helpful owners. Delicious fresh bread and croissants for sale each morning in the reception area! Easy access to Meribel on the Olympic Gondola (1/2 hour ride from Brides to Meribel). Very reasonably priced ski hire. Good selection of restaurants for eating out in the evening and a local Spar shop close but with everything you need to put a coupe of easy meals together. Would recommend and definitely stay there again. Thank you for your review - we are pleased to hear you enjoyed your stay in Brides les Bains. We hope you will return in the future. Great to have you stay with us again - having returnee guests is the best recommendation we can receive. Glad you found the new washing machine useful. Thank you for your review and we look forward to your next visit. We stayed at the apartment for a week during the summer holidays and had an awesome time. Suzanne who owns and manages the apartment was amazing responding to our relentless flood of queries leading up to our holiday. We wanted to explore a bit of France on our way to Brides-Les-Bains from England and Suzanne was exceptionally helpful in assisting us with planning a road trip suggesting which towns to stop over and providing us with tips of where to go and what to see. The apartment is well equipped, exceptionally spacious and has stunning views of the mountains which can be enjoyed from a private balcony. Its close proximity to the centre of town makes for a pleasant walk which we did most days with our three young children. There is so much to do and see in the area. Most of the gondolas were in operation when we were on holiday which allowed us to get up to the mountains where we enjoyed some lovely walks. We highly recommend the apartment and look forward to returning in the near future. Thank you for your review and lovely comments. The Alps in the summer are a great family holiday destination and we have enjoyed many summer holidays walking, cycling and swimming with our 3 children. The climate is usually similar to the South of France - but fresher thanks to the mountain air. We are glad you enjoyed your stay and hope you will return in the future. From December to April, Brides is part of the famous Three Valleys Ski resort - the largest linked ski resort in Europe which also includes the highest Ski resort of Val Thorens and the chic resorts of Meribel & Courcheval. In the summer, there also is plenty to do as the Alps becomes a summer playground of activties. Brides itself is beautiful with a river running through the town and two parks. Other activities in the area include hiking, mountain biking, kayaking, horse riding, golf, paragliding, high wire trail. There are a number of festivals in the area throughout the Spring and summer. The sports cente in Meribel offers an olympic size indoor pool, bowling and ice skating. The new Aquamotion centre in Courcheval offers indoor and outdoor pools, water slides and even a climbing wall. There is even summer skiing on the glacier at Val Thorens and Lake Annecy is only an hour away by car. From April to October, Brides is the ideal place to take slimming cures and the apartment is close to the top class Thermal and Spa centre. Whether you travel by aeroplane, train or car, Brides is accessed via the town of Moutiers. Self Drive - 9 hours approx from Calais. Airports - Chambrey 83 km / 1 hour approx, Grenbole 112km / 1 hour 15 mins approx, Geneva 168km / 2 hours approx, Lyon 188km / 2 hours approx Train to Moutiers - there are some direct trains from London St.Pancras in the ski season or change at Paris (from the Gare du Nord to the Gare du Lyon). Brides les Bains is linked by a ski gondola to Meribel centre ( the very heart of the Three Vallets) so a car is not necessary. However, if you have a car it is easy to drive up to Meribel where there is free parking available. We can advise you on the best place to park based on the dynamics and ski ability of your group. Have young children that don't want to ski all day ? We can advise ski schools and on a private nanny company who can either look after young children all day and/or collect children from ski school and take back to the apartment for the afternoon. There is a 'Spar' supermarket in Brides which can cater for all your needs. Also, there is a large 'Super U' supermarket 10 minutes drive away on the Moutiers road which is very good value. Looking for more than one apartment ? I work closely with 2 other owners with similar apartments in the same residence so we can accommodate groups. There is a compulsory cleaning / end of stay charge of £60 in the ski season to ensure that the apartment is fully serviced and checked between guests. From April to October, guests may opt to clean the apartment themselves and the end of stay charge can then be reduced to £30. Linen and towels are not included in the rental price - these can be provided for £20 per person or guests may bring their own if they prefer. Rental prices are based on upto 6 people sharing the apartment - there is a small supplement of £35 for the 7th or 8th guest. We are required to charge Tax Sejour ( French tourist tax) of £0.60 per person per night ( aged 18 years plus) - we pass this tax directly to the local Marie's office.